Food in Thailand is one of the jewels of living there. Thais have a philosophy that meals should balance five fundamental flavors: hot (spicy), sour, sweet, salty and bitter. Make sure you recognize their eating customs before you move there! 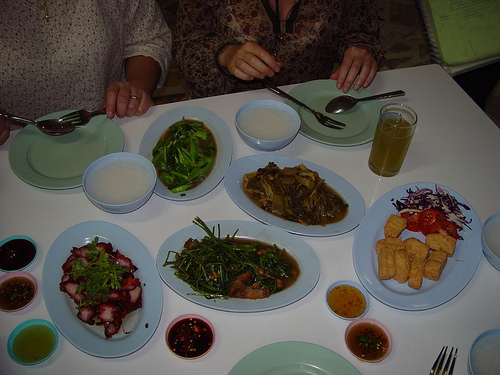 In Thailand, food is often served family-style. People do not order one meal exclusively. Everyone has their own bowl of rice, and the middle of table is full of different things to eat for everyone. The typical common set-up includes a bowl of soup, one plate of fresh vegetables, one spicy dish, and a selection of different sauces. Unlike many Asians, Thais use forks and spoons to eat rather than chopsticks. When eating with a family, there are no serving spoons or forks, but everyone will dip into the common dishes with their own spoons and eat bit-by-bit of their selection. Thais do not have the concept of taking large portions of food on their individual dishes at once. Babies and toddlers will often sit on their relatives’ laps and spoon-fed. There is no word in Thai for high-seat or high-chair. Some common sauces are nampla prik, which is a fusion of fish sauce, Thai chili peppers and lime juice; namprik tadeng, which is chili paste, fish sauce, sweet palm sugar and sour tamarind; and namprik kapi, which is shrimp paste, garlic, chili peppers and eggplant. There are customs to using the eating utensils during your meal. Spoons must be held in the right hand, and forks in the left. Thais use spoons as their main instrument of eating; forks are used to supply the spoon with food. 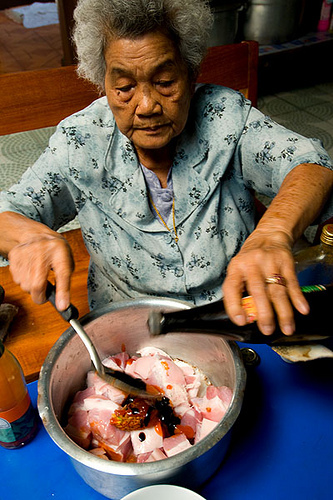 Sticky rice, a common dish, is often eaten with fingers. There is no need for knives, as food is generally cut up into pretty small sections. You are allowed to eat as soon as you are served. You do not need to wait for your hostess or for the oldest person to start eating. It isn’t required that you finish all of your courses, but you should finish all of your rice, as rice is viewed as sacred. If you get food on your fingers, you should wipe it off with a napkin. If you lick it off, you will get stared at. Most people do not drink wine in Thailand. The most common alcohols that people have with food are light beers and whiskey mix drinks. Also, tipping at cheap restaurants is not expected.